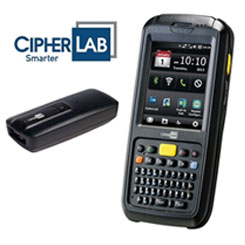 The CipherLab CP60 series mobile computer is designed specifically for applications in transportation and logistics, warehousing, manufacturing and field service. The rugged CipherLab CP60 is an industrial mobile computer designed to fully assist your staff in the field with the most cutting edge specifications. Crafted for the harsh environments of transportation and logistics, warehousing, manufacturing and field service, this tough mobile computer will allow your workers to maximize productivity with the most up-to-date technologies.